too lazy to cook: screw it, let's go to phuket! screw it, let's go to phuket! Every once in a while I need a short getaway and where better than Phuket to escape the cold Hong Kong weather! We only had two full days there, though that's plenty when you're burnt...This time round we stayed down by Karon beach. I've never actually been that far south so it was almost like visiting a new place - though truth be told all the beaches look pretty much the same to me. pancakes, bacon and maple syrup for the win! This one was alright but nowhere near as good as Two Brothers. As you can tell, it was overly saucy and tasted a bit like they just used ketchup :P I didn't like the beancurd bits either, and portions were small...Saving grace - there were no flies here. I think it cost 100 THB which I thought sounded pretty pricey until I saw the amount she gave us!! One whole mango and a whole lot of sticky rice. I had made two restaurant reservations for the two nights we were in town. One was at Mom Tri's Kitchen, recommended by one of my friends. It was quite close to our hotel (about 15 minutes on bike) and had a stunning view of Kata Noi beach. We weren't feeling particularly hungry that night so only ordered two mains, though they do also give you a lovely pumpkin soup and forest berry sorbet on the house. We had asked for the tuna to be cooked medium rare and although it does look quite pink in the picture above, it was actually pretty tough. More like medium to well done! I did like how they gave you a poached egg though :) Overall, probably not worth the price - it was about HK$170 which seems pretty hefty in Thailand. I enjoyed this a lot more! It doesn't look fantastic in the picture but the pork belly was melt-in-your-mouth tender and the scallops were perfectly seared. I enjoyed the (pumpkin?) puree as well, though the bok choy was slightly hard to eat - I should've just asked for chopsticks! I can see how beautiful this place would be at sunset - unfortunately, we arrived close to 9pm so everything was pitch black and it didn't help that it had been raining. We weren't overly impressed by the food but given the setting, ambiance, and great service, I guess the prices are understandable (though I was surprised that there was 10% service charge and a hefty tax on top of that!) If only we had room for their decadent sounding desserts which I've heard great things about. 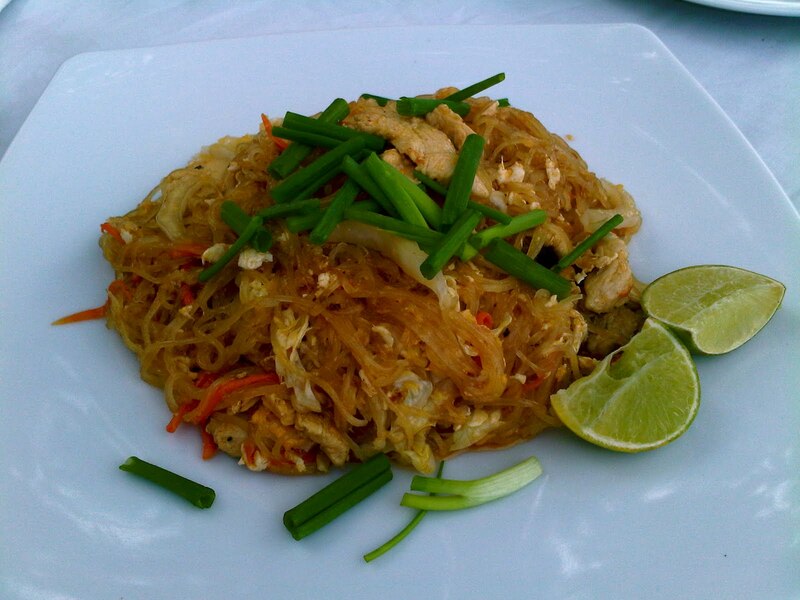 Our other meal was at Suay Restaurant which according to our very friendly waitress recently became the top rated restaurant in Phuket on Tripadvisor! (I did check this out when I got back home and you should take it with a grain of salt considering they only have 20 odd reviews). This restaurant's a bit trickier to find. It's located in the heart of Old Phuket Town, about 45 mins ride from Patong. The street was devoid of tourists and the restaurant looked completely out of place in its surroundings, sandwiched between old shopfronts and dilapidated bike garages. 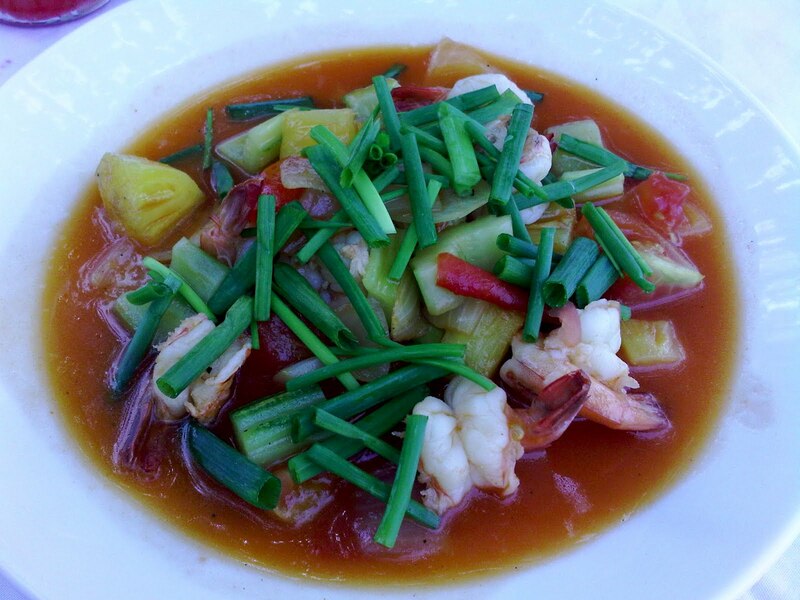 I was surprised to find such a beautifully tranquil restaurant on one of the shabbier streets of Phuket. I loved the openness of the restaurant and it was really nice sitting outside on the 'veranda' with a perfect view of the garden. Super relaxing, despite the constant beeps of the mopeds putt-putting outside. It almost reminded me of one-thirty one in Hong Kong with the large law, small house restaurant, and sheer simplicity of the decor. The restaurant is considered Thai fusion but I think it's more innovative Thai as I couldn't really tell what it was trying to fuse with :P Much of the menu sounded fun and playful, and it was lucky that the portions were small so we could order a lot more, tapas style! 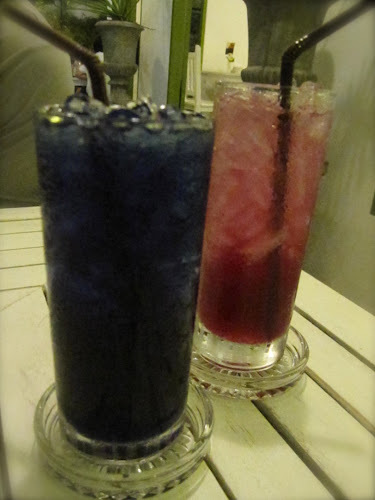 I loved the butterfly pea juice (do overlook the crazy blue colour!) I can't really tell you what it is besides sweet and delicious. It came highly recommended by our waitress, as did the jasmine lilac which was a fizzy drink with hints of jasmine tea. I enjoyed this. It was a coconut based soup that had a bit of a kick to it. There were some mushrooms and chilli's hiding underneath the foam and the scallop on top was divine. Too bad they didn't give more than one! I was pretty disappointed with the soft shell crab. Basically, you order your salad base of assorted greens and pomelo, and then you can choose what ingredient to add on like grilled salmon, scallops, or as we chose, crispy friend soft-shell crab. I think the soft shell crab was the most expensive add-on but it definitely wasn't what we expected. All we could taste was the fried bread crumbs. It almost felt like we were eating fish fingers! I could hardly taste or see any crab meat. :\ I will say though that the chef was nice enough to cancel the salad portion off our bill because when it first came, there were no pomelo bits in our salad. That's pretty good service. Fortunately, the rest of our food fared a lot better. The chicken skewer was soo juicy and tender but I actually liked the flavour of the pork more which was marinated really nicely. These were pretty good. They give you the middle part and it comes with a really nice honey glaze sauce. Super crispy, if a little bit overly fried. You don't usually see fresh prawn spring rolls in Thai cuisine - I find it much more a staple in Vietnamese food - so I was really happy to see the non-fried variety on the menu. This definitely tasted very fresh and they give a decent amount of prawn. I didn't think it needed the accompanying peanut sauce as the flavours were just right. I was surprised how spicy this was! On the menu it was described as sweet green curry, and all the green curry I've had in HK have been just that. However, this tasted almost like a red curry to me. I powered through with lots of white rice and butterfly pea juice! The beef was hit and miss - some pieces were pretty tough whilst others were much more tender. Flavour-wise it was pretty good though. Something I found interesting on their menu was that they offered watermelon rice. Apparently they steam the rice inside a watermelon so you get a bit of the watermelon flavour and the rice comes out tinted pink! One of my favourite dishes of the night, we almost ordered a second! The sea bass was perfectly grilled and I liked that it was a filleted so I didn't have to worry about bones. 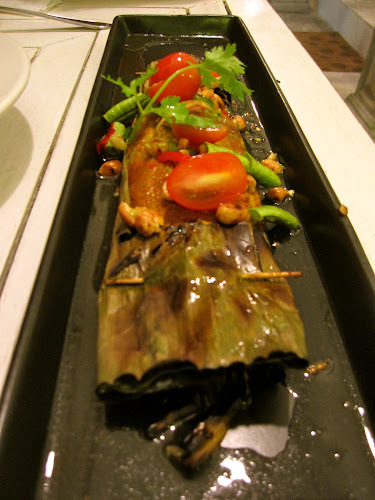 Bursting with flavour from the tumeric, banana leaf, and peanuts. This was the perfect end to our meal. I've never had fried sticky rice and this just proves that if you fry anything, it'll taste even better ;) The sticky rice didn't lose it's consistency and I liked that there were mango bits inside it. It also came with flamed mangos on the side and black sesame ice cream which seemed like a strange combination until I tried it all together - for some reason, it just works. Super delicious, I'm going on the hunt to find some in Hong Kong!